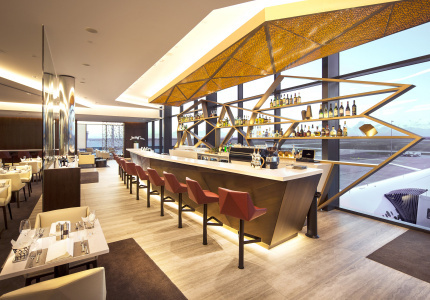 Why rough it when you can enjoy air conditioning, award-winning wine and wi-fi instead? Here are five of Australia’s best new glamping spots – Aerogard need not apply. Camping has come a long way since the days of pitching a tent and hoping it’ll hold up in the weather. These days, things can get pretty lavish. Waterside pavilions, farm-to-table dining and outdoor bathtubs are the new jaffle irons and camp showers. 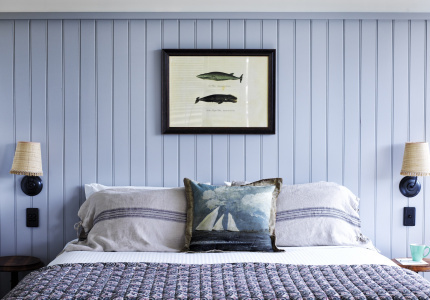 And forget about sleeping bags – these luxury stays have queen beds and fresh linen. If you want to get amongst the wilderness (but at the same time maintain a safe distance from it), here’s where to head. 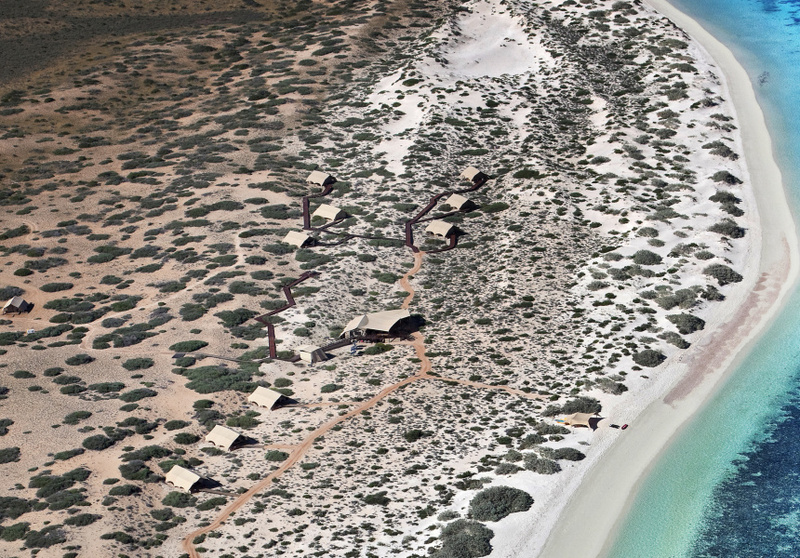 This 15-tent eco-resort is around two hours’ drive along a lonely coastal road from Exmouth, WA, which is about a two-hour flight from Perth. But its remote location means you’ll be forced to get off-grid – there’s no internet connection here (not yet, anyway). You’ll eventually reach Cape Range National Park, where the ochre soil meets the white sand and blue water of the Indian Ocean. The camp itself is just steps from the 260-kilometre-long Ningaloo Reef, home to 250 types of coral and 500 species of fish. Snorkelling equipment is included in your stay, and you can add a boat ride from which you can swim with whale sharks, and spot orcas, dolphins, turtles, dugongs, manta rays and humpback whales. Sal Salis is built on a series of raised platforms and boardwalks to limit erosion and protect the goannas, wallaroos, rock wallabies and echidnas that inhabit the area. Almost 100 per cent of the camp’s energy comes from solar panels, eco-friendly soaps and shampoos are provided, and waste is sent back to Exmouth for treatment and disposal. But it still feels more luxurious than some inner-city hotels. Beds are king size and linens made from unbleached cotton. Each tent has an ensuite bathroom and ocean views. At dusk, spend time reading in the hammock slung across your deck, or get to know the other guests at the self-service bar, or at a camp dinner, held on a long communal table. Twin-share tents start at $900 per night per person, with a two night minimum stay. Sirromet Wines in Mount Cotton, Queensland, may be well known for its vino, but this glamping experience is worth the trip alone. The expansive estate, 30 minutes’ drive south of Brisbane, is home to 18 tented pavilions overlooking a beautiful, tree-lined lagoon. Each enormous tent comes with a queen bed, lounge area and outdoor deck, and feels relatively secluded despite their proximity to one another. The trees surrounding the lagoon also keep you protected from the early-morning Queensland sun. An in-tent ensuite, wardrobe, well-stocked minibar and free wi-fi mean you’ve got little reason to go outside, but if you do venture out, try chef Mat Fulford’s paddock-to-plate degustation menu at Restaurant Lurleen’s, the winery’s handsome dining room, and sample some of Sirromet’s drops, which have collected more than 900 domestic and international awards. If you time your stay right, you can attend one of the enormously popular A Day on the Green concerts, held on Sirromet’s rolling hills with views out towards the bay. Pavilions start at $280 per night, twin share. This luxury eco-glamping retreat is on a 280-acre property loaded with wildlife, rolling hills, creeks and bushland in the Central West wine region of NSW. It’s a 20-minute drive from Mudgee, and just under four hours north-west of Sydney. Sierra’s tents are spacious – one sleeps seven people – all with glass sliding doors offering an unimpeded view of the surrounding bush. Some have designer kitchens, dining tables, fireplaces, and bathrooms with a shower and flushing toilet. One comes with a fire pit, and a hot tub on the outdoor deck. 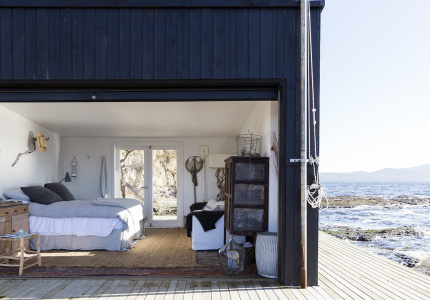 Aside from the views and the usual amenities (linens and the like are provided), you’ll be charmed by the thoughtful touches here, such as marshmallows for roasting on the fire, a welcome pack of goodies such as muesli and pancake mix, and treats from local chocolatiers. If you can bring yourself to leave your tent, spend the day sampling drops at one of Mudgee’s many wineries and microbreweries, or take a daytrip to Wollemi National Park to experience the best of the Blue Mountains. Tents start from $420 per night, twin share. In a lovingly-restored shearing shed surrounded by imposing red gums, this winery is home to one of the friendliest characters in the region: winemaker Sue Bell. Bell hosts tastings during the day and six-course meals several nights a week, and now she’s opened her back paddock to glampers. The boutique campground houses six spacious bell tents, which come with cast-iron beds, fresh linens and other creature comforts. A communal bathing block houses a claw-foot bathtub, showers and toilets. You’re encouraged to make yourself at home here. You can cook with produce and fresh herbs from the garden, and eggs from the property’s chickens; or join the winemaking team in producing this year’s vintage. Included in your stay is a bottle of Bellwether’s Ant Series wine and home-baked sourdough. There’s plenty to do, too. 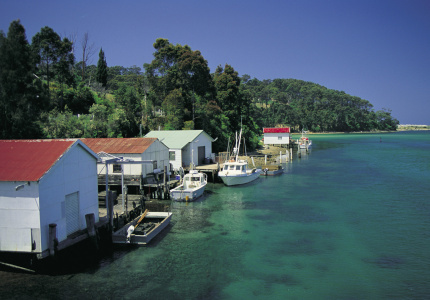 Visit one of Coonawarra’s many cellar doors and restaurants, or take a road trip – the World Heritage-listed Naracoorte Caves are a 20-minute drive away, or head to the fishing towns of Robe or Beachport for a seaside jaunt. Twin-share tents start at $200 per night. 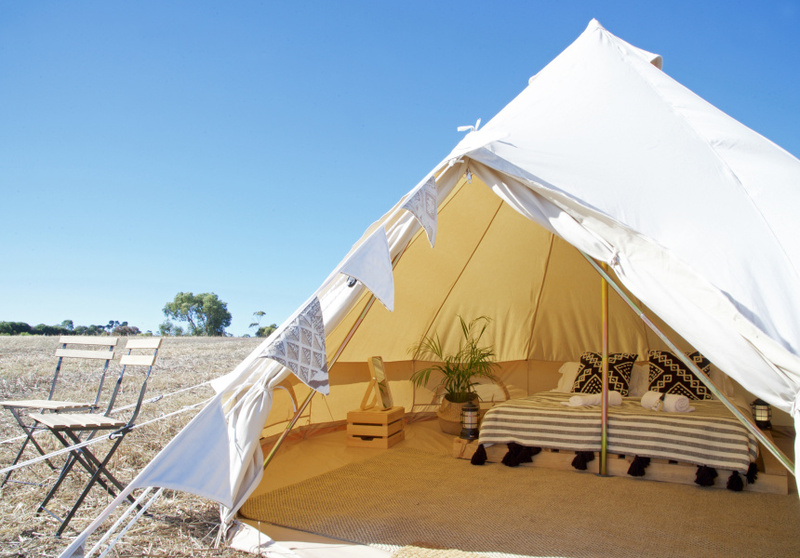 Until June, a tiny village of tents is popping up at Terindah Estate winery on the Bellarine Peninsula, Victoria. 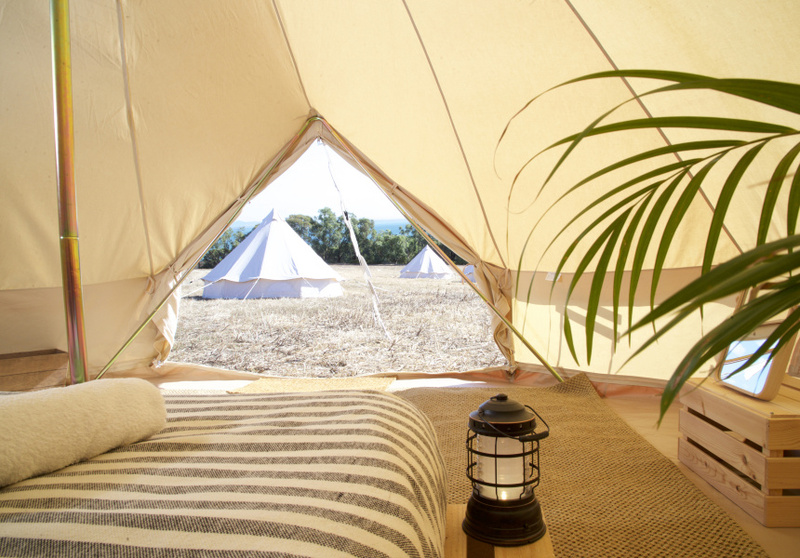 The 15 luxury bell tents sit on the hills overlooking Port Phillip Bay, giving you a chance to see seals, dolphins and whales from the comfort of your own tent kitted out with a queen bed, linen, towels, a USB lantern, a few furnishings, some greenery and a natural jute rug. There are communal toilets and showers, too. The site, a 90-minute drive from Melbourne, is on the Bellarine Taste Trail, so you’ll find wineries, cellar doors and farm gates nearby. And it’s a 16-minute walk to The Whiskery, where you can settle in with a Teddy and the Fox small-batch gin. If you’d rather stay put, a picnic hamper will set you back $100 but feeds two, and comes stocked with terrines, smoked and cured meats, sourdough bread, Manzanillo olives and pickles. An optional French breakfast basket (filled with pastries, chocolate bread, juice and coffee) can be delivered to your tent in the morning too. The Shed, Terindah Estate’s on-site restaurant, is open for breakfast on weekdays and dinner on weekends. Tents are priced at $200 per night, twin share. This article was updated on April 4, 2019.